Sécheron offers a range of earthing switches for high-voltage circuits in the railway industry. 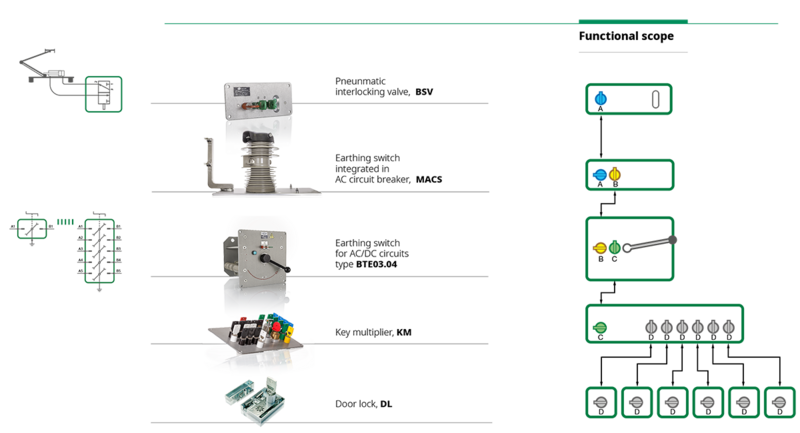 Our circuit breakers and earthing devices, whether separate components or integrated solutions, are part of our proven cascade approach to earthing. Earthing high-voltage circuits prior to maintenance is critical to keeping workers safe. On rail vehicles, the first step to proper earthing is to earth both poles of the main circuit breaker once the breaker has been opened. On 15 kVAC and 25 kVAC rail vehicles, Sécheron’s BVAC circuit breaker is coupled with the BTE15/25.04; Sécheron’s MACS circuit breaker features integrated earthing. For DC rail vehicles operating at voltages of up to 3 kVDC, our UR circuit breaker is coupled with the BTE03.04. Once this step has been completed and the main circuit breaker earthing switch interlocking key has been released, the earthing switch on the high-voltage circuits downline can be operated. DC link circuits on AC rail vehicles and traction converter filters on AC and DC vehicles are earthed using one of the many available versions of our BTE03.04. For DC vehicles both earthing steps can be performed by a single BTE03.04. The BTE03.04 can be delivered as a stand-alone product or integrated into Sécheron’s smart, compact MODBOX® high-voltage enclosure with other high- and low-voltage functions to ensure the electrical safety, measurement, and control of the traction chain. Rated insulation voltage 27.5 kVAC (MACS AC circuit-breaker integrated earthing switch). Rated insulation voltage 17.25 kVAC (BTE15.04) or 27.5 kVAC (BTE25.04). Rated insulation voltage 2300 VAC/DC or 4800 VAC/DC (BTE03.04). Peak short-time withstand current 62.5 kA (BTE15/25.04 & MACS earthing switch. Peak short-time withstand current 75 kA (BTE03.04). High insulation level against earth – OV4. 2 pole version (BTE15/25.04 & MACS earthing switch). 2 to 10 pole versions (BTE03.04). No breaking nor making capacity. Optional auxiliary switches for switch position indication. Outdoor installation (BTE15/25.04 & MACS earthing switch). Suitable for ambient temperature – 40 °C to +70 °C.